Seonid was not an idiot. She knew what happened to a body subjected daily to the treacherous sweetness of her particular vice, the heady, careening slide into anonymity. She knew what it meant when the night tremors and sweats came earlier each day. She was no three-penny fool, mewling and lurking at the edges of alleys, hoping to beg enough coin for a dram of oblivion. There was a man she passed each day along the Way of Roses. At his feet, his beggar’s bowl was always empty; his bones showed clearly through his thin shirt. 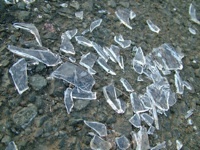 He cast bits of broken glass on the ground like runes. For a penny he would tell your fortune, mumbling and cursing at his failing sight. For two, he would tell of greater things: of princes and wars, of sorcery. For three and a cup of wine he would speak truth, mixing his powder with the spirits, precious and prescient. No, she was not that sort of fool, not yet. So when the honey-haired man and his coldly beautiful sister led her into the back room, she knew she should refuse. But their words were tinged with pink, and their movements dripped with good intentions. They made promises; she chose to believe them, this one last time. More in the Sable Mark series can be found in previous posts: Need, Salt, Beast, The Other Sort of Need, Damask, Deep Magic, The Scent of Apple, Sanctuary. This entry was posted in Awards, Sable Mark, Writing and tagged 2nd place, sable mark, seonid, trifecta. Bookmark the permalink. Brilliantly told in so few words. This familiar story is rarely written with such grace and concision. A successful effort, this. Many thanks! It all started with one phrase, and grew from there. This is fantastic. No hyperbole in that compliment. I love your word choice, the scene, everyng. I was pulled in not only quickly, but completely. Very top notch storytelling. I’m interested in the whole series. Very, very much. I know, I should have typed “everything” in my last comment. I’m sloppy that way. I’ve just read through all the Sable Mark pieces and I had to tell you I’m utterly smitten. I can’t stand having to wait to see the story unfold. You just made me blush – full-on, candy apple red. Thank you so much for the sweet words! Again with fresh reworking of the tropes. And I get to tell every one I know you, too! “She was no three-penny fool, mewling and lurking at the edges of alleys, hoping to beg enough coin for a dram of oblivion.” That was just so powerful. I love how this character is so self aware, yet so completely in the thrall of her addiction. Oh, good – that’s exactly what I was going for! I’m glad it came through. Thank you for commenting! ooohh, love the ending. So many bad things lurking. Thanks for joining up again. You’ve done an incredible job of introducing us to Seonid in a very short space. In just three paragraphs, you show us how conscious she is of everything that’s happening and her ability to think rationally; but despite this, she is unable to do what she knows she should. I love how you say ‘chose to believe them’ right at the end. It suggests that even now, she is still thinking clearly –she knows, but the lure is too great. And the ‘ not yet’ after ‘she was not that sort of fool’ is also revealing. Great response to the prompt. Hope to see you over the weekend too.